Crystal Group complements its off-the-shelf product portfolio with custom system design and development services, provided by an expert engineering staff with decades of experience with military, industrial, and commercial systems and devices. When a program, mission, or challenge requires a custom solution, Crystal Group delivers – on time and on budget – with custom product design and development services. Crystal Group can craft a customized, innovative design – whether a rugged server or workstation, an embedded computer, or rugged displays, networking appliances, or data storage systems. Contact Crystal Group’s helpful and knowledgeable staff for a quote, a custom solution, or more information. 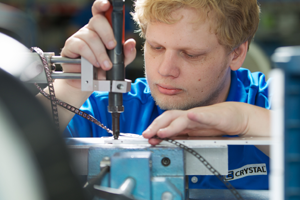 Crystal Group employs innovative manufacturing and assembly techniques to ensure the performance and reliability of commercial off-the-shelf (COTS) equipment over a long operational life in even the most extreme environments. Manufacturing techniques, which further differentiate Crystal Group from competitors, include: stabilizing components to endure shock and vibration, increasing air flow to cool hot electronics components, and enhancing conductive and convective heat transfer mechanisms to extend the thermal limits of COTS electronics. Innovative, rugged chassis designs are crafted with 6000-series aluminum coated with a corrosion inhibitor that maintains the electrical conductivity of the chassis and ensures low-impedance interfaces – further extending performance and useful life, particularly in challenging environments. Crystal Group’s electrical assembly techniques conform to J-STD-001 and IPC-A-610, the most widely used electronic assembly standards establishing industry-accepted workmanship criteria. Precision machining and inspection is completed in-house by trained personnel in our adjacent 40,000 sq. ft machine shop. Utilizing the latest technology in multi-axis machining equipment, our HAAS CNC machines can perform a variety of complex machining operations. After machining, products are run through our Zeiss Coordinate Measuring Machine (CMM) to insure the highest quality for the end user. Lastly, machined metal can be routed through our vibratory tumblers, chem-film, and paint/powder coat processes for a rugged finish. Crystal Group’s facilities, quality management system, and quality operating procedures are certified to ISO 9001:2015/AS9100D quality management standards. Contact Crystal Group and ask for a quote or more information. Our systems engineers work closely with our program managers to accurately capture your requirements and oversee your projects. We employ a system of reviews and check points to ensure the customer gets exactly what they want and need, including systems requirements review (SRR), preliminary design review (PDR), critical design review (CDR), and production readiness reviews (PRR). Programs are managed in Microsoft Project and risk management techniques are employed to ensure optimal use of resources and decision making results.